The rise of Communism in Russia and later the Soviet Union was a topic I studied heavily at school in History, from its first implementations with the growing popularity of Lenin all the way through the Cold War period and eventually its downfall in the early 1990s. One topic that increasingly engrossed my interests was the power struggle that followed after dictator Joseph Stalin’s death in 1953, and how several personalities in Stalin’s cabinet were desperate to secure the position for themselves by any means necessary, which led me to imagine how ridiculous and often quite humorous their attempts must have been if they had been seen by other perspectives. Luckily, Armando Iannucci must have had the same kind of imagination as I did, because he takes that very situation and uses it as the basis for his latest satire The Death of Stalin, and for the most part showcases dramatized versions of these events that are at once both hilarious and rather frightening with fascinating, if a little odd, results. It opens up in 1953 Russia, where Stalin (Adrian McLoughlin) is such a feared presence with every strange demand of his met with no complication, that he requests a recording of a live orchestral performance he heard on the radio, leading to a stressed producer (Paddy Considine) to rush about to try and fulfil his request. Shortly afterwards, Stalin collapses from a brain haemorrhage and soon dies, leading to his senior cabinet – including the clueless Georgy Malenkov (Jeffrey Tambor), the level-headed Nikita Khrushchev (Steve Buscemi), the old codger Vyacheslav Molotov (Michael Palin), and the absolutely repulsive creep that is Lavrentiy Beria (Simon Russell Beale) – to figure out what the next step is. Naturally, most of them want to assume power and begin to rectify their fallen comrade’s terrifying grasp on the Soviet Union on their own terms, but the fight for leadership – or at least Iannucci’s vision of it – is about to get a lot more ridiculous. The trailers seem to offer this movie as a laugh-a-minute political farce, something in the same vein as Dr. Strangelove, but while the film as a whole can indeed be classed as a comedy, and often has some very funny scenes and dialogue, it is most definitely of the black variety. Death and fear is a huge part of Russian society at this point in time, with swift arrests and executions happening at every corner all at the whim of a list of apparent traitors that Stalin has decreed and Beria, being the head of the Soviet security force, casually puts into motion. Even the cabinet members themselves are always on alert, because this is a place where at any moment they could be shot or worse just for saying the wrong thing at the wrong time, and their combined clamouring for the position left behind by Stalin is more one for mere survival than ego-serving control. However, Iannucci manages to find the darkly funny spot in each one of these horrendous situations and even more vile characters, playing with their insecurities and manipulative tendencies to often riotous, but always disturbing, extremes; much of that is directed towards Malenkov, who turns out to be such a useless and awkward strategist that it often raises a laugh when you think about how this pathetic man has been given this much power over an impoverished country, but then almost immediately grounds you when you realise that people are seriously suffering because there is such buffoonery going on at the very height of the hierarchy. Another amusing stroke of genius on Iannucci’s part is to not even bother have his actors adopt a Russian accent; every single person keeps either their British or American accent intact, despite playing some very Russian figures – Adrian McLoughlin as Stalin speaks like a Cockney gangster in his limited screen time, while Jason Isaacs in a scene-stealing turn as the head of the Soviet army has a distinctively Northern accent – which makes it all the more hilarious when you hear them talk about some of this really dark and disturbing stuff in the actors’ own dialects, because coming from a more familiar language makes everything seem that much more ridiculous. It helps to make it seem that much more of a straight-forward farce, and actually incorporating any kind of Russian accent would have been distracting and detract away from the real cartoonish exploits that go on in this film, ones that already don’t need thick and silly accents to be funny. As darkly funny and amusing as it is to watch, the film tends to suffer with its overall tone and pacing, which makes it feel a little disjointed and prevents it from being a truly excellent comedy. There are times when the bleak realities of death and fear overshadow the intended comedy, and you often don’t know whether to laugh or be seriously disturbed when it’s not made abundantly clear it’s meant to make you laugh. It also takes a short while to really get things moving, and when things finally start to appear like it’s in full speed, it rather abruptly comes to a grinding halt and you’re not left entirely satisfied with how it wraps up, especially when there was all of that build up that hinted at heading towards something funnier and darker than what we end up getting. But there are still plenty of laughs to be had while watching The Death of Stalin, even if they are the kind of laughs that make you feel a little unclean after you’ve calmed down and had a chance to think about it. 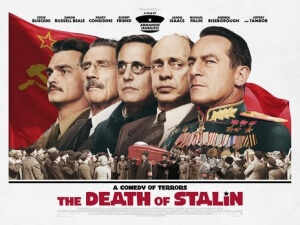 The Death of Stalin is a largely amusing dark satirical comedy with plenty of laughs on display, especially at the ridiculous and often bleak situations it depicts, but a slight misbalance in tone and pacing prevent it from being the truly excellent comedy it could have been.